Too often we only focus on being green or environmentally friendly when it is convenient or when the microscope is on us, like during Earth Day. 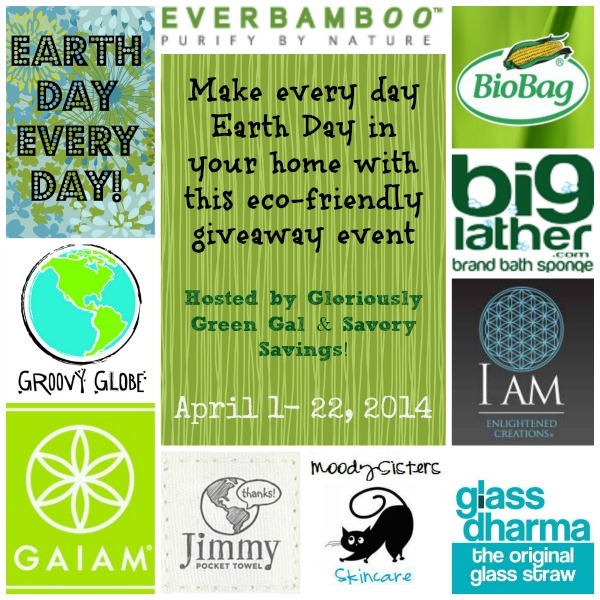 So Krista from Savory Savings & Gloriously Green Gal wanted to challenge you to make Earth Day – Every Day! Take everyday household items and replace them with green and more eco-friendly versions. To help you get started, we have this amazing series of giveaways to hop through so that you can win! Enter one or enter them all! Even better? There is a fabulous Green Kitchen Grand Prize! This prize valued at over $100 includes a gift certificate to Glass Dharma, Bamboo Charcoal deodorizers from Ever Bamboo and a countertop Compost Bin with compostable bags from BioBag! How lucky we are to be able to offer all of these prizes. It is something we all need to make more effort to do. Earth Day should be Every Day! To learn more about the grand prizes and all the other giveaways you can win during this event, check out Krista’s reviews below! But wait, there’s more! We have some other great prizes that you will see in the hop! These will include these gems from Emilee over at Pea of Sweetness and Deals of Sweetness! Would you like to win one of these fabulous prizes? Or perhaps the grand prize which includes a countertop compost bin from BioBag, $25 to spend with Glass Dharma, and natural bamboo deodorizers from Everbamboo? Enter with the giveaway tool below! And don’t forget to keep hopping through to all of the amazing prizes! This giveaway is open to US residents, ages 18 and older. If you have won a prize from any of the grand prize sponsors in the last six months, you are not eligible to win the grand prize. The giveaway will run from April 1 – 22, 2014 until 11 PM CST.